Neurones are electrically active cells and their ability to process and integrate information is dependent on their electrical properties. The membrane potential is a feature of all cells but is exploited by neurones to generate electrical activity. The membrane potential refers to the fact that under resting circumstances the inside of a cell has a negative charge relative to the outside. This charge is a consequence of the different concentrations of ions inside and outside the cell and the only partial permeability of the cell membrane to the movement of ions across it. The dominant cation in the extracellular fluid is sodium (where it is paired with chloride as its anion). However, within the cell the concentration of sodium is much lower (around 10mM compared with 140mM in the extracellular fluid). Conversely, while the concentration of potassium is high inside the cell (140mM) it is low outside (around 5mM); proteins constitute the bulk of the intracellular negative charge. Given that the cell membrane has some permeability to both sodium and potassium, it seems odd that these concentration gradients can be maintained: if no other factors were in operation a solute should have equal concentrations in two communicating compartments. However, both the sodium and potassium are ionised and thus, as well as their concentration gradient they generate an electrical gradient by means of their ionic charge. In a hypothetical model, the inside of a cell could have begun with a high concentration of potassium while the extracellular environment could contain no potassium. If the cell membrane that separates the intracellular compartment from the extracellular was permeable to potassium, the potassium ions would start to diffuse down their concentration gradient and into the extracellular fluid. However, as the ions moved they would alter the electrical gradient. Each ion that leaves the cell would remove a positive charge, rendering the inside of the cell less positive (or more negative) and would contribute that positive charge to the extracellular compartment. Hence, an electrical gradient would begin to develop and that gradient would oppose the movement of the potassium ions down the concentration gradient. Eventually, the two opposing gradients would cancel out and the movement of potassium ions would stop. This is the equilibrium or reversal potential. The equilibrium potential can be calculated for an individual ion with the Nernst equation. The situation in a real cell becomes more complicated because more than one ion contributes to the membrane potential. The effects of potassium, sodium and chloride all impact on the membrane potential, as does the permeability of the cell membrane to these ions. Once the dust has settled on the various electrical and biochemical nuances, cells have a resting membrane potential that is around -75mV to -90mV. The contribution of permeability to this final value means that the resting membrane potential can be different between different cells if they have different permeabilities for one or more of the three ions and also that manipulating the relative ionic permeabilities alone can alter the membrane potential. The fact that the cell membrane is not fully permeable to the movement of ions and is composed of lipids and is therefore an insulator with regard to the flow of electric current means that the membrane functions as a sort of capacitor. A further consequence is that the electrical activity is concentrated in the region of the membrane. The flow of current in neurones is the basically the same as that of current in any other system. If part of a neurone is depolarised current will flow along the voltage gradient generated by that local depolarisation. As with all circuits the electrical circuit within a neurone needs to form a loop. One part of the loop is formed by the intracellular part of the neurone and the other is formed by the extracellular fluid. The lipid membrane acts to separate the two limbs of the circuit and ion channels and pores in the membrane of the cell provide the points of communication. Diagram of electrical conduction in a neurone. The black arrow indicates the side of initial depolarisation. Current flows in small circuits and moves the depolarisation along the membrane of the cell. Passive conduction of this sort is the process employed in dendrites and the cell body. 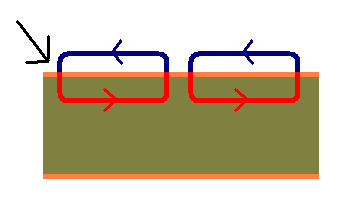 It is effective over short distances but for longer distances, as exist in axons, leakage of current into the extracellular fluid and dissipation of current due to the resistance to electrical conduction within the cytoplasm of the axon mean that simple passive conduction would not be able to propogate the depolarisation along the axon before it faded to nothing. Instead, a signal boost is required. Action potentials are sharp surges in electrical activity produced by neurones. They serve both as the output signal of the neurone and a signal booster. An action potential occurs when a neurone opens a set of sodium channels in its cell membrane. These channels have a high permeability (or conductance) to sodium and allow rapid entry of sodium into the cell. This causes a rapid and marked depolarisation of the cell membrane. The number of sodium ions that needs to enter the cell is not necessarily that high because the process only has to occur in the transmembrane region, not throughout the entire cytoplasm of the cell. The trigger for the opening of these sodium channels is depolarisation of the neuronal membrane to around -60mV, whch in turn is caused by synaptic input from another neurone. The sodium channels of the action potential are voltage-gated and are opened by depolarisation. The channels are proteins which possess several subunits that span the membrane. One of these subunits contains numerous positively charged amino acids. If the cell depolarises, this subunit will move towards the outer surface of the membrane because it is repelled by the increase in positive charge inside the cell. This movement physically opens the ion channel if the motion is of a sufficient degree. The opening of the ions channels occurs in only that part of the neurone's cell membrane which was depolarised. The powerful depolarisation (up to +40mV to +60mV) and large voltage gradient caused by the action potential allows current to flow along the axon. The flow of current along the neurone can then trigger an action potential a little further along the axon. If the signal had any thoughts of fading away due to leakage and resistance, the next action potential fires and gives the signal a hefty kick and ensure it passes on. This process repeats along the neurone until the action potential reaches the synaptic terminal, where it activates synpatic transmission. The same process underlies the action potential in cardiac myocytes, although the cardiac action potential is extended by a secondary influx of calcium through voltage gated calcium channels. One the action potential has fired, the neurone has to restore its membrane potential. This is achieved by shutting the sodium channels (which have an intrinsic autoclose function / deactivation) and by opening potassium channels that allow potassium to leave the cell, taking positive charge with them. 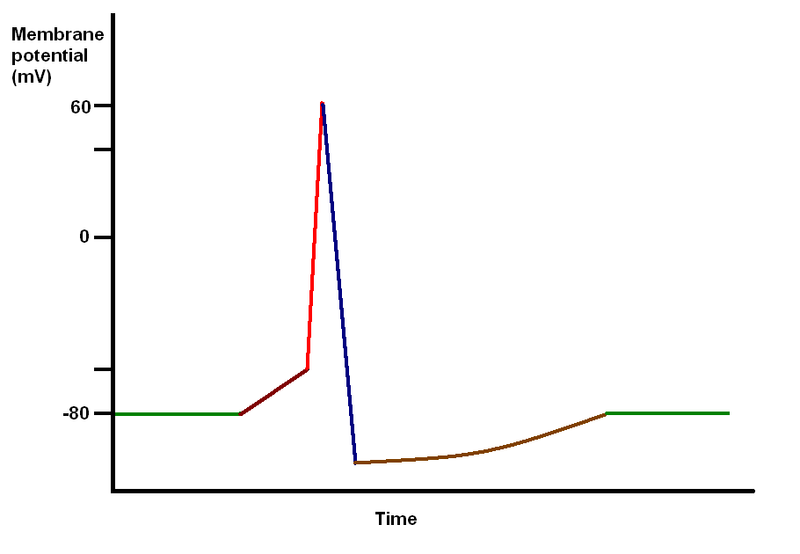 An action potential and the recovery phase when the neurone is restoring its membrane potential last for 1ms. This is the neurone's absolute refractory period. During the absolute refractory period it is impossible for the neurone to fire another action potential. Following the absolute refractory period is the relative refractory period. In the relative refractory period the neurone requires a bigger stimulus than normal to fire an action potential. The relative refractory period occurs because the voltage gated sodium channels are recovering from their inactivation and some remain resistant to restimulation. Although the number of ions that move in and out of the neurone during a single action potential is not large as a proportion of the neurone's total ion complement, the changes will accumulate and become significant after repeated action potentials. Given that a neurone might be able to fire up to 1000 action potentials per second, a mechanism is necessary to move sodium ions out of the cell and to bring potassium ions back in. This is achieved the sodium-potassium ATPase pump which is an ion pump that shoves three sodium ions out of the neurone for every two potassium ions it brings back in. Myelin is a lipid rich substance that is made by oligodendrocytes in the central nervous system and by Schwann cells in the peripheral nervous system. it is wrapped around axons and provides electrical insulation. Most axons in the body are myelinated. Myelination reduces current leakage from the axon and also insulates nearby axons from each other, ensuring that they do not short circuit or cross circuit each other. It also markedly enchances the speed of conduction of an electrical impulse along the axon because the flow of ions across the axonal membrane is restricted to the spaces between the coats of myelin (know as Nodes of Ranvier in the peripheral nervous system) and action potentials thus jump from one space to the next rather than occuring at more closely spaced intervals. The fastest fibres in a human can conduct at 70m/s; by contrast conduction in unmyelinated axons limps along at 2-5m/s.